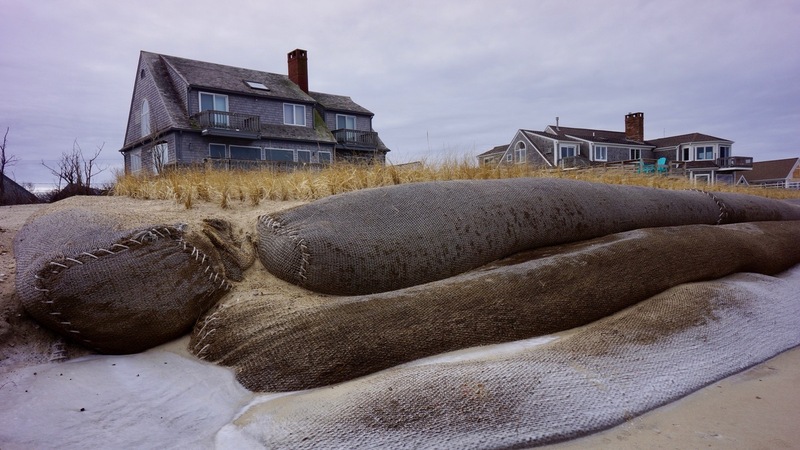 Combatting Coastal Erosion In Cape Cod With Coconut Fiber Rolls Beachfront homeowner Laura Wing in Sandwich, Mass., says the sand in front of her house is eroding away. Her best option is to create man-made dunes by installing huge fiber rolls along the shore. Uncovered fiber rolls in front of a private home on Town Neck Beach in Sandwich, Mass. Made from coconut fiber and filled with sand, they are designed to prevent beach erosion. These days the water is 50 feet from her home at high tide. It's typical to have houses right on the shore on Cape Cod, and storms can cause a lot of damage. 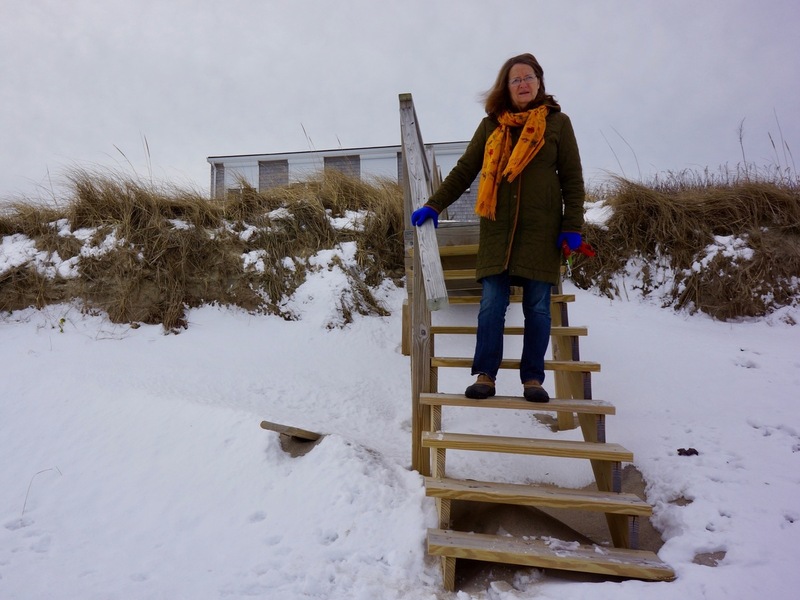 Laura Wing in front of her beachfront home in Sandwich. Wing has not installed fiber rolls. This natural dune helps protect her home from erosion for now, but spring storms could make it vulnerable. But whatever Wing decides to do with her property could also affect erosion on nearby public beaches. According to Dave Deconto, the director of natural resources for Sandwich, there is a beach in town where public and private land meet. The private homes on the beach have fiber rolls in front of them — the beach next to the rolls is pretty washed out and has lost a lot of sand. That's because whenever you construct a dune, even a fiber roll dune, there's going to be more erosion where the dune ends and the beach begins. Mother Nature's gonna do what Mother Nature does. There are other options for slowing erosion. One method uses barriers to break up the wave action before it hits the coastline, but it hasn't been approved by Massachusetts environmental regulators. Deconto says whatever homeowners decide, all of the fixes are temporary. "Mother Nature's gonna do what Mother Nature does," says Deconto. "Every town on the coastline of Massachusetts is dealing with it; every community along the Eastern Seaboard, and the Gulf Coast, and the West Coast of the United States are dealing with it." Fiber rolls are mostly being used by private homeowners right now because the high cost can be a barrier for small coastal towns and most buildings on public beaches are farther inland and not as vulnerable as beachfront homes. Massachusetts officials recommend fiber rolls because they have a lower impact on natural habitats than other methods for slowing erosion. The good news is, they are biodegradable. The bad news is, that means they have to be reinstalled as often as every five years, though some may last decades. The price can vary from $200 to $2,000 per square foot, depending on where they are installed and the materials that are used. Seth Wilkinson, who installs these systems, he says he has had some hard conversations with homeowners. "And they're saying, 'I don't think I can afford to live here anymore. Repairing this bank or stabilizing this bank will cost more than the value of my home.' "
Wing says she isn't going to install fiber rolls for now. "I can't cover that kind of expense by renting the house, so that just comes out of my savings. And I'm retired." She says she is taking things one year at a time and hopes she doesn't lose her home in a storm before she decides to sell.